Lunch is Optional: Laissez les bon temps roulez! My wife and I had a pair of tickets to watch her favorite football team come to town and destroy the Redskins. It didn't quite happen that way. This is not a sports blog, so I won't get much into the game except to say it was the craziest athletic event I have attended. What transpired on the field should not have happened. Carly's team won, ugly, and in overtime. But a win is a win. 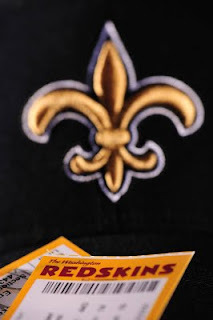 It can only be explained one of two ways: the Redskins are cursed, or this year's Saints are a team of destiny. I guess we will know when the Super Bowl ends and see if the Saints are on top of the board. Sometimes its better to be lucky than good. My favorite photo I made at the game I didn't even know I made until I got home. I must have pushed the shutter and not noticed. Its not an awe inspiring photo, but that is how the day felt to me. A little sideways, a bit blurry, and colorful.